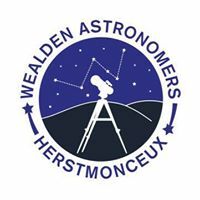 The next meeting of the Wealden Astronomers will be at Herstmonceux Village Hall on Friday 7th December 2018 at 7.00 for 7.30 PM - Tea, Coffee & Biscuits. Quiz night with Chris Ellis - Bring food that you like i.e. Sausage rolls, Biscuits, Mince pies, Cakes etc. The usual observing if the sky is clear. Tonight's speaker will be Dr Stephen Wilkins (East Sussex University). John Fox will give short talk about Astrophotography.